Land of Enchantment: UFOs: Cover up or uncovered? UFOs: Cover up or uncovered? GALLUP — Whether you’re a true believer, an open minded seeker, or an out-an-out skeptic, Chuck Wade hopes you attend Gallup’s UFO Film Festival this weekend. 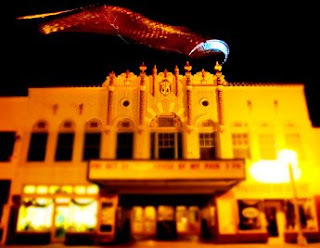 Four documentary films will be featured at the Fifth Annual UFO Film Festival, which will be held from 5 to 11 p.m. on Saturday at El Morro Theatre, 207 W. Coal Ave.
“I think people should come and take a good hard look at the evidence that UFOs are real,” said Wade, the founder of the film festival. As for Wade, he has no doubts about the existence of UFOs. Born and raised in Corona, Wade said the reported crash of an alien aircraft in the world famous “Roswell Incident” took place near his childhood home. The man who discovered the alleged crash site asked Wade’s father to inspect the site, Wade recalled, but his father turned him down — a decision that he later regretted. The Wade family did store some of the broken-up aircraft parts in their barn before military officials collected them, Wade added, and he recalls seeing the parts in the barn. Independent - October 24, 2008: UFOs: Cover up or uncovered?